When you edit or review a presentation, you can create comments for the slide, or graphics, images, and text boxes on a slide. All comments and responses for the presentation are displayed on in the collaboration sidebar. You can take actions on comments, such as reply, resolve, delete, and so on. The comments you create stay associated with the content they refer to. A comment marker is displayed next to the border box of the object that it refers to, and multiple comment markers are displayed on the same object stacked vertically. You can also add comments in the page level, but there will not be comment marker. The collaboration sidebar acts as a record of all comments in the presentation where you can easily see the most recent comments and responses. Click a slide in the Slides view and click where you want to insert a comment. Click Team > Add Comment. A new comment box is displayed. Type your comment in the field, and click Post. The comment stays associated with its location in the presentation and is also displayed in the sidebar with your name and the date and time the comment was created. 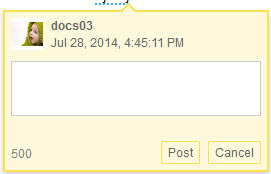 Tip: If you want to direct the comment at a co-editor, enter the @ symbol. A list of editors of the presentation is displayed. Select the editor that you want from the list, and then enter your comment. When a comment is directed at you, you receive a notification in the @ Mentions section of IBM® Connections Cloud and in an email, if specified by your Connections Cloud notifications settings. Reply Respond to a comment. View more replies or View fewer replies View the full thread of responses for a comment with more than two replies. Resolve Mark a comment as resolved. The comment becomes gray to indicate its resolved status and the marker is removed from the slide. A resolved comment's in-text box can only be accessed by clicking the comment in the sidebar. Reopen Reopen a resolved comment. Delete Remove a comment from the presentation. The comment and its replies are removed from the sidebar and the in-text comment box with the corresponding marker is removed from the cell.